This is NOT the correct monkey, but it’s close. Hi! About 3 months ago, I won a stuffed monkey out of a claw machine. Ever since then my daughter has been completely inseperable from it. 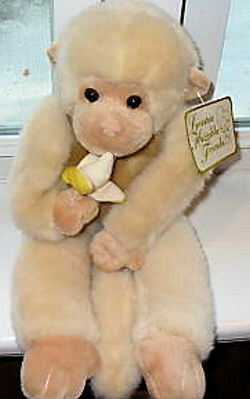 The monkey is around 12-15″ long, very soft, light colored, with a cute and happy face, holding a banana with BOTH hands. She named it “Mary” and wouldn’t sleep without it. We came home yesterday and found that our dog had made its way into her room and onto her bed. He had pulled down the monkey and destroyed it. My daughter is devastated, and for the last 2 days she will not sleep! I have searched ENDLESSLY to find the same monkey, as I have tried to buy her a different type and she doesn’t want anything to do with it! If you can help AJay find this Claw Machine Champagne Monkey Holding a Banana in Both Hands, THIS SITE IS NO LONGER ACTIVELY MANAGED. Please use Our FREE FACEBOOK GROUP, including #100808-4 in the subject, . 330233431980 here it is as a buy it now. These don’t look right to me, but I will ask her to post a comment. I see one Tami tried to differentiate with a last initial … LOL! but you both have the same last initial, too!!! I’ve asked her to look at these 3 you’ve both listed and put a comment here on the blog. Hey patients like me too, I think. Just curious Tami R, what is your middle initial? mine is J. It is funny that we are both nurses and both Tami R. I’ll stick with spelling my name with lower case letters. You are a great searcher! I’m enjoying watching the two of you! Just for your information, Tami 2, Patients Like Me is the name of a website that the first Tami and I both belong to!!! I love your answer!!! Didn’t have a clue that it was a website, so you answered very logically!!! LOL! Oh that is so funny… my husband and I got a good laugh out of that! Thank you! everyone of you for your valient efforts! unfortunately i looked at all the listings, but non of them are her. the picture in wanted ad is very close. Thank you so much!